Comet ISON was destroyed in its encounter with the Sun. Telescopes saw the giant ball of ice and dust disappear behind the Sun, but only a dull streamer emerge. Astronomers continued to search for the object, but it eventually became clear that the much vaunted “Comet of the Century” had gone out with a whimper. Despite its great size, ISON was probably torn apart in the immense heat and tidal forces so close to the Sun. 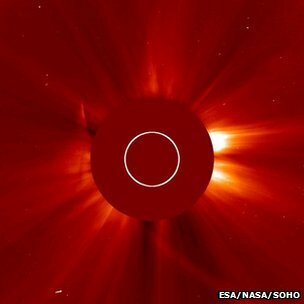 The ESA’s experts on the SOHO Sun-watching satellite called the death of the comet at about 21:30 GMT. “Our SOHO scientists have confirmed, Comet ISON is gone,” ESA’s twitter feed announced. ISON had captivated skywatchers with its promise ever since it was discovery by Vitali Nevski and Artyom Novichonok in 2012. A “fresh”, 2 km-wide object flung in towards the inner Solar System from its home far beyond the outer planet Neptune, it was hoped it might produce a brilliant tail that would arc across the night sky, perhaps for weeks. And, as it got closer and closer to the Sun, its ices did indeed begin to vaporise, releasing dust that shimmered in a distinctive trailing stream. But from early on, it was clear ISON was unlikely to be spectacular; it was just not brightening in the way experienced comet watchers had anticipated. This led scientists to fear for its survival when it eventually grazed past the star at a distance of just 1.2 million km at 18:35 GMT on Thursday. SOHO followed ISON as it began its sweep around the back of the Sun, but then failed to pick up a coherent object at the time it was supposed to re-emerge. A streak in the imagery was interpreted as the last fizzling of debris. Other telescopes such as NASA’s Solar Dynamics Observatory could detect no clear sign of the comet’s nucleus, either. Passing close to the Sun, ISON would have been subjected to temperatures over 2,000C. And the immense gravity of the star would also have pulled and squeezed on the object as it tumbled end over end. All the evidence suggests ISON’s nucleus was torn apart in the close pass, in the same way that Comet Lovejoy – a previous hopeful in 2011 – was disrupted.